Several causes had led up to this disaster, though Don Diego’s debut as a corkcutter had brought matters to a head. When a couple of generations back the original Fairbairn had founded the business, Brisport was a little fishing town with no outlet or occupation for her superfluous population. Men were glad to have safe and continuous work upon any terms. All this was altered now, for the town was expanding into the centre of a large district in the west, and the demand for labour and its remuneration had proportionately increased. Again, in the old days, when carriage was ruinous and communication slow, the vintners of Exeter and of Barnstaple were glad to buy their corks from their neighbour of Brisport; but now the large London houses sent down their travellers, who competed with each other to gain the local custom, until profits were cut down to the vanishing point. For a long time the firm had been in a precarious position, but this further drop in prices settled the matter, and compelled Mr. Charles Fairbairn, the acting manager, to close his establishment. It was a murky, foggy Saturday afternoon in November when the hands were paid for the last time, and the old building was to be finally abandoned. Mr. Fairbairn, an anxious-faced, sorrow-worn man, stood on a raised dais by the cashier while he handed the little pile of hardly-earned shillings and coppers to each successive workman as the long procession filed past his table. It was usual with the employees to clatter away the instant that they had been paid, like so many children let out of school; but to-day they waited, forming little groups over the great dreary room, and discussing in subdued voices the misfortune which had come upon their employers, and the future which awaited themselves. 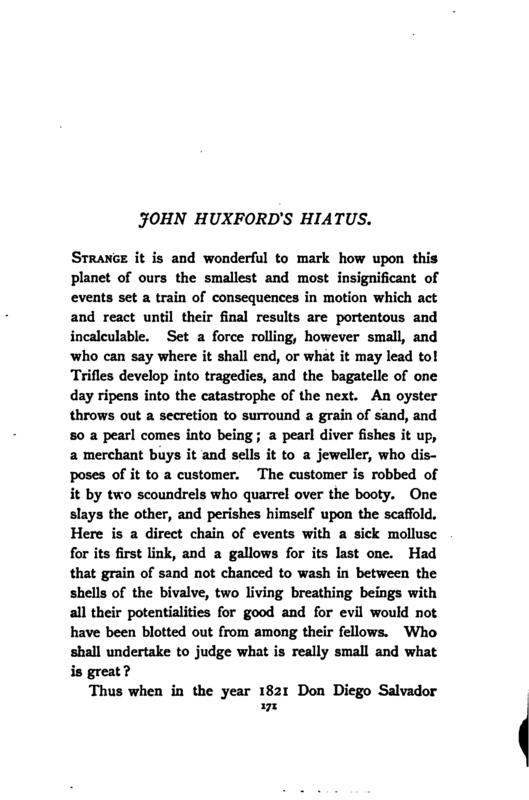 When the last pile of coins had been handed across the table, and the last name checked by the cashier, the whole throng faced silently round to the man who had been their master, and waited expectantly for any words which he might have to say to them. “God bless you, sir! God bless you!” cried a chorus of rough voices. “Three cheers for Mr. Charles Fairbairn!” shouted a bright-eyed, smart young fellow, springing up upon a bench and waving his peaked cap in the air. The crowd responded to the call, but their huzzas wanted the true ring which only a joyous heart can give. Then they began to flock out into the sunlight, looking back as they went at the long deal tables and the cork-strewn floor—above all at the sad-faced, solitary man, whose cheeks were flecked with colour at the rough cordiality of their farewell. “What would you advise, then, sir?” asked John Huxford. So thick was the vapour that the houses over the way were only a vague loom, but the foreman hurried on with springy steps through side streets and winding lanes, past walls where the fishermen’s nets were drying, and over cobble-stoned alleys redolent of herring, until he reached a modest line of whitewashed cottages fronting the sea. At the door of one of these the young man tapped, and then without waiting for a response, pressed down the latch and walked in. “No, of course not,” Mary answered with conviction. She was an orphan with no living relation save her old grandmother, and no thought in life but to make a helpful and worthy wife to the man she loved. Where these two were she could not fail to find happiness. If John went to Canada, then Canada became home to her, for what had Brisport to offer when he was gone? “It will be a weary, weary time until we hear from you, dear John,” said Mary, clasping his hand; “but it’s God’s will, and we must be patient. Here’s pen and ink. You can sit at the table and write the letter which is to take the three of us across the Atlantic.” Strange how Don Diego’s thoughts were moulding human lives in the little Devon village. “And that will be very soon, my lass,” he answered cheerfully, with a last embrace. “Good-bye, granny, good-bye.” The ship was a mile and more from the land before he lost sight of the figures of the straight slim girl and her old companion, who stood watching and waving to him from the end of the grey stone quay. It was with a sinking heart and a vague feeling of impending disaster that he saw them at last as minute specks in the distance, walking townward and disappearing amid the crowd who lined the beach. From Liverpool the old woman and her granddaughter received a letter from John announcing that he was just starting in the barque St. Lawrence, and six weeks afterwards a second longer epistle informed them of his safe arrival at Quebec, and gave them his first impressions of the country. After that a long unbroken silence set in. Week after week and month after month passed by, and never a word came from across the seas. A year went over their heads, and yet another, but no news of the absentee. Sheridan and Moore were written to, and replied that though John Huxford’s letter had reached them, he had never presented himself, and they had been forced to fill up the vacancy as best they could. Still Mary and her grandmother hoped against hope, and looked out for the letter-carrier every morning with such eagerness, that the kind-hearted man would often make a detour rather than pass the two pale anxious faces which peered at him from the cottage window. At last, three years after the young foreman’s disappearance, old granny died, and Mary was left alone, a broken sorrowful woman, living as best she might on a small annuity which had descended to her, and eating her heart out as she brooded over the mystery which hung over the fate of her lover.